Note: A version of this originally appeared in the pages of St. Lawrence University’s the Hill News last year during my tenure as a music columnist. The article has been changed and reprinted with permission. This week I decided to take a break from my recent trend of reviewing disappointing television to share a Halloween treat that is near and dear to my heart. Like many people, I celebrate the holiday by decorating all that I am physically capable of decorating, planning out my costume, and watching my favorite horror movies. Unlike a lot of other people, I also celebrate by repeatedly watching the music video for the hair metal theme song to a Nightmare on Elm Street sequel. The past few years have given rise to some truly innovative music videos that have challenged the limits and the scope of the medium. Unfortunately, all of these noble experiments in the music video arts are ultimately inconsequential, because the best music video ever made came out in 1987. 27 years ago, the forces of art and commerce came together in a perfect union as the 80s metal giants Dokken released the video for their theme for the film Nightmare on Elm Street III: the Dream Warriors and suddenly, in the span of five minutes, the world was irrevocably changed for the better. For those unfamiliar with the band in question, Dokken was a staple of the 80s pop metal scene. The band had a streak of hit albums throughout the early and mid-1980s, only to implode in the latter half of the decade due to infighting and a falling out between the band’s lead singer and lead guitarist. Admittedly, that describes a solid 3/4ths of 80s glam metal bands, but let’s not talk about that right now. The band made fun, catchy hard rock with decent pop sensibilities and made delightfully cheesy music videos to accompany said songs. They are exactly the kind of band that the kind of people who refer to themselves as “true metal fans” on the internet hate for making fun, catchy hard rock with decent pop sensibilities. While all of their videos are great—filled with the pastiche of fantasy elements and shots of band members breaking loose from chains one should expect from bands from this era—the video is a perfect storm of Halloween imagery, over the top metal video tropes, and campy fun to hurtle it into the stratosphere of greatness, or a least the stratosphere of Specifically Things Will Standish Thinks Are Great. The video follows Patricia Arquette (Patricia Arquette) as she wanders through a dilapidated dream world haunted house populated by creepy children and a lurking Freddy Krueger. If it were nothing more than this, it would just be a five minute ad for a forgettable horror sequel and I would not be enthusiastically writing about it (I love this job). But another force stalks the halls of Freddy’s terror-shack. They are 80s metal sensation Dokken, and, as per the lyrics, they do not want to dream no more. Ladies and gentlemen, our dream warriors arise. Rather than arming themselves with conventional weapons or a staunch refusal to believe in Krueger (that’s how you defeat him, you see), Dokken come armed with attitude, amazing hair, and shredding guitar solos. At first Patricia Arquette backs away from the band in fear—a fact that never really sat right with me because the opening shots clearly show she has pictures of the band on roughly every surface of her room—but eventually she recognizes Dokken for the saviors that they truly are. I mean, it doesn’t help that guitarist George Lynch burst through a wall to greet her or the fact that drummer Mick Brown is playing inside a creepy furnace at one point for some reason. The point is, Dokken knows something that generations of teens in horror movies didn’t: how to rock. In her recent review of the original Nightmare on Elm Street, Sarah Lawrence called the film a perfect 80s horror movie, and I’d like to submit that this music video is the perfect 80s metal video. The 80s metal videos is an art form onto itself, adhering to a set of rules and guidelines I can only presume are gathered in an ancient tome that resides somewhere on the Sunset Strip. The genre has a set of tropes and functions utilized time and time again by different bands. The results are often at once incredibly silly and endearingly earnest. Convoluted sci-fi or fantasy plots are common. A band playing in abandoned and decrepit factories, and band members changing instruments/ clothes midway through a song are among some of my personal favorite tropes. Dokken acknowledges these elements and presents the best of them, here culminating in the most tried and true of 80s metal video themes: the unadulterated power of rock, where music leaves the realm of metaphorical weapon and becomes a literal weapon, frequently used against evil overlords and stern high school principals who just want those damn kids to cut their hair and show some respect. At the end of the video the band corner Freddy Krueger and defeat him with the power of their rock. 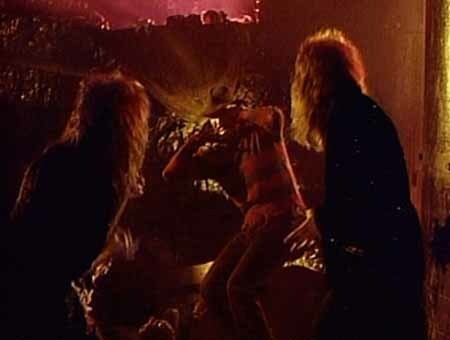 Freddy Krueger literally cowers in fear because he cannot handle how hard Dokken rocks. It’s criminal that they don’t give academy awards to metal videos because this deserves to win all of them. “Dream Warriors” is a signifier of a strange era in music. A popular band could make a video of them fighting a movie villain and play it completely straight and no one would bat an eye. It’s this complete sincerity that makes this video a personal favorite. Bands will occasionally try to make videos that throw back to 80s metal videos, and they are always underwhelming because they are all made under veils of irony. The joy isn’t seeing Don Dokken declare himself a dream warrior, it’s in seeing he absolutely means it. I’d call it a guilty pleasure, but there’s no guilt here. “Dream Warriors” is fun and a little ridiculous, just like the best hair metal bands. It’s an excuse to let loose and have a good time wrapped up in the guise of horror, and that makes it the perfect Halloween treat.